Reset Your Printer by Yourself! Get Reset Keys or Firmware Keys here! Home » Service Manual Catalog » EPSON Adjustment Programs » InkJet printers » AP_R360 I have paid for Reset Key but not received yet. How to reset Epson PP-100? How to reset Canon G1000, G2000, G3000 printers? How to buy Reset Keys? How to get FREE RESET KEY? How to reset waste ink counters in old models? How to Disable Epson Status Monitor utility? How to run Windows 98, XP programs under Windows 7, 8, 10? Recovery code in the License.exe utility to return the Epson printer to chipless firmware not working. How to reset Epson 3800 when maintenance tank sensor says it's missing. How to reset Epson flashing lights error - waste ink counter? 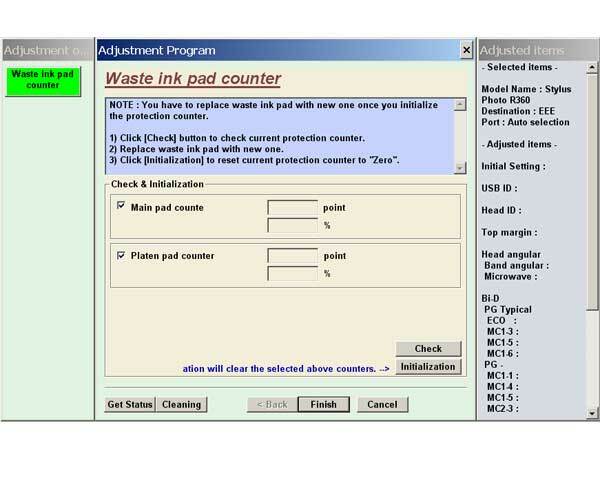 How to reset Canon waste ink counter? How to reset HP printers? A printer error has occured. Turn power off then on again. For details see your documentation. The Epson Adjustment Program for Epson R360 can be used under Windows only (Millenium, 2000, XP, Vista [in compatibility mode]). Purchase the utility from 2manuals.com. You'll get download link on-line and in the email message. We recommend reading the Epson R360 Service Manual before using the adjustment utility. You can run this program under Windows XP, Windows Vista, Windows 7 in compatibility mode. It is easy! Lets get to know how to set it up. To configure the compatibility mode for an application, just locate the installation directory and right click on the .exe file (program you want to run), selecting Properties from the menu. 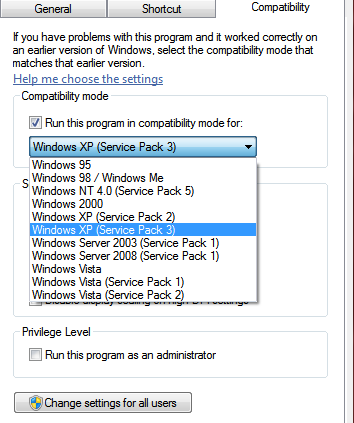 You can choose to run the program in Windows XP compatibility mode. FOR THIS PROGRAM please use the WINDOWS XP compatibility mode!!! Download the program and run in compatibility mode! We are in business since 2002 and do our best to give our customers perfect service! Thank you. for the program. It worked on TX106 printer. Reset waste ink counter in few minutes. Not go to epson customer service. Good. Want to sell Reset Keys in Your country?